Michael Cheika has been criticised on a number of occasions this season after a string of poor performances from the Wallabies. But he proved his worth this past weekend with a rousing half-time speech. 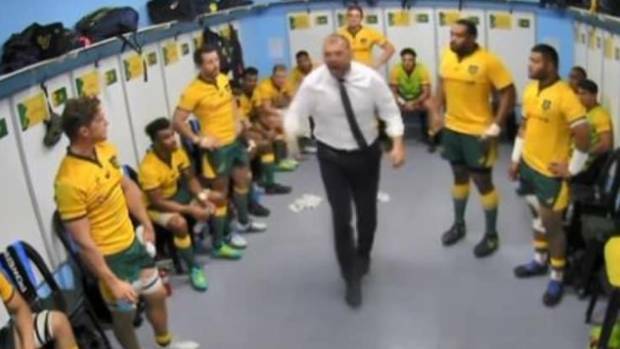 With the Wallabies trailing 31-7 at half-time against Argentina in the Rugby Championship – Cheika can be seen absolutely tearing into his team in the changing rooms. And it worked, with Australia orchestrating the biggest comeback in test history among tier one nations to beat Argentina 45-34. Cheika however, remained tight-lipped on what he said in the changing rooms after the game. “It is not for public airing,” Cheika said. “This game is personal. We needed to get some personal meaning into our game because in the first half it was not there,” he told reporters. “Once the lads got some meaning and purpose into their game, they played a heck of a lot better. Check out Cheika’s rant below.